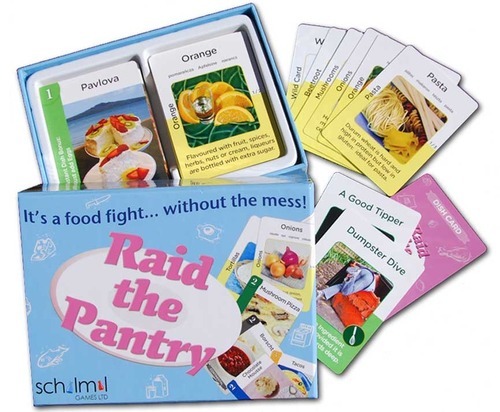 Raid the Pantry is an award winning game by Amanda Milne and Julia Schiller, published by SchilMil Games. It is for 2-4 players. 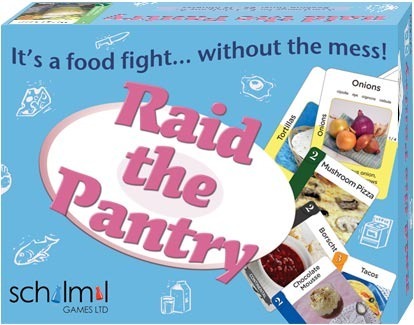 In this game, players will try to make dishes by collecting ingredients and performing actions. To begin, the Dish cards are shuffled and players are dealt 3 cards each. Then the ingredient cards are shuffled with the first 3 cards placed face up in the middle of the table. This forms the “Rubbish Bin”. Players are then dealt 6 ingredient cards, the rest now form the “Pantry”. Action cards are shuffled and then play begins. Play begins with the youngest player. The player can take one of 2 actions. One action is they can take the top action card or if they 3 or fewer cards take the top action card and two ingredient cards. The other action is they can discard 2 ingredient cards into the “Rubbish Bin” and take the top ingredient card from the “Pantry”. When an action card is drawn, it may either take effect immediately or be able to be used later depending on the icon. If the action card has a wisk on it, it takes immediate effect. If the action card has a canister on it, it can be played at any time. These cards do lots of different things that can be either beneficial or hurtful. There are also special cards like the Wild card that can be used to stand in for any ingredient. Once a player has the right ingredients to complete a dish, he will place them down along with the accompanying Dish card. At this point the player will take a new Dish card from the stack. Once a player has met the required amount of points, determined by the number of players, the game is over. That player is declared the winner. Component wise, there are only decks of cards. That said, they look great. Everything is done from photographs, from the dishes to the action cards. Let me tell you, I got hungry just looking at the pictures of each dish. These are really well done and are smooth to the touch. They hold up well to repeated play and are really nice. The rulebook is very nicely done with easy to read and understand instructions. There are several pictures to help with setup as well as examples of game play. It fits nicely in the box and looks good to boot. There is a lot of great game here. I really like the interaction between players through the use of the marketplace action cards. Many times I would get just the item I needed at that moment to finish a dish. I like the ability to drop cards into the bin and draw a fresh one from the pantry as well. There’s just so much to like about this game. It really plays well. As I stated earlier, this game has won several awards. It was the winner of the New Zealand Games Association’s New Game of the Year for 2013. 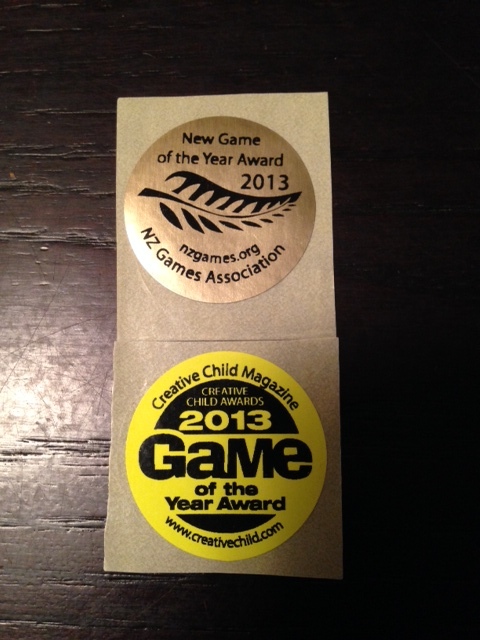 It also won New Game of the Year for 2013 from Creative Child magazine. I have to say, it’s well deserved too. This game is a lot of fun to play. It’s a very light game of hand management and set collection. It’s easy to understand and easy to play. I really like everything about it. I highly recommend giving it a try. Just don’t be surprised if you suddenly become hungry while playing it. I did. For more information, please check out SchilMil games at their site. Aside | This entry was posted in Reviews and tagged amanda, amanda milne, board, board games, card, card games, game, julia, julia schiller, milne, pantry, raid, raid the pantry, review, schiller, Schilmil, schilmil games. Bookmark the permalink.